My idea for making Saskatchewan a better place to live is for the government to re-establish the successful employment strategy for Indigenous Peoples in this province. For 12 years, there was a program in place that improved employment for Aboriginal Peoples but the Wall government cancelled it and 98 partnership agreements in March 2010. In the spirit of the call for action of the Truth and Reconciliation Commission, our government needs to address economic and social inequalities among the Indigenous Peoples in the province. The Wall government brings to mind a famous quote when you look at their actions on Aboriginal employment “If anyone thinks he is doing something when he is doing nothing, he deceives himself.” This government believes they are sound on the Aboriginal file. They think they are doing something, even though the statistics show worsening conditions, so they are only deceiving themselves – and the people of Saskatchewan. The former Aboriginal Employment Strategy Program had tremendous success. Fortunately, unions like CUPE, negotiated language in collective agreements that commits employers to improve training and hiring of Aboriginal Peoples. This paper will provide an overview of the representative workforce strategy in health care and argue for the expansion of this strategy throughout the province. Saskatchewan’s population is changing. We have more people who live in cities than on farms, we have become more diverse, and we have an aging non-Aboriginal population and an increasingly younger Aboriginal population. There have been significant strategies tried over the last decade to change the labour market statistics for First peoples in Canada. despite these efforts, concerns remain as First Peoples still experience significant labour market disadvantages compared to other Canadians. In general, First Peoples have a lower labour force participation rate, a higher rate of unemployment, less representation in higher paying occupations and lower average wage rates. One area in which a significant effort has been made to address this issue is in the health care sector in Saskatchewan. The representative workforce strategy and the partnership agreement were designed as a focused approach in response to RCAP (Royal Commission on Aboriginal Peoples), which recommended that, when working with Aboriginal people, a different approach to employment equity is needed. The partnership agreements were the different approach. From 2000 to 2009 in the Saskatchewan health industry, this new approach resulted in an increase in the Aboriginal participation rate from 1% to 6%, with approximately 2,400 Aboriginal Peoples hired. There were big gains in areas with traditionally low participation rates and a large Aboriginal population. In Prince Albert, the Aboriginal participation rate increased from 9% of all workers to 20%. In Regina, it increased from 1% to 4.1%. More than 500 Aboriginal people took a health care work preparation program. This was a 16-week program that included a half-day CUPE presentation that discusses the union’s structure, the collective agreement and addressed the concerns that Aboriginal people have about unions. 21,000 staff from health care workplaces participated in Aboriginal awareness training, including 10,500 CUPE members. 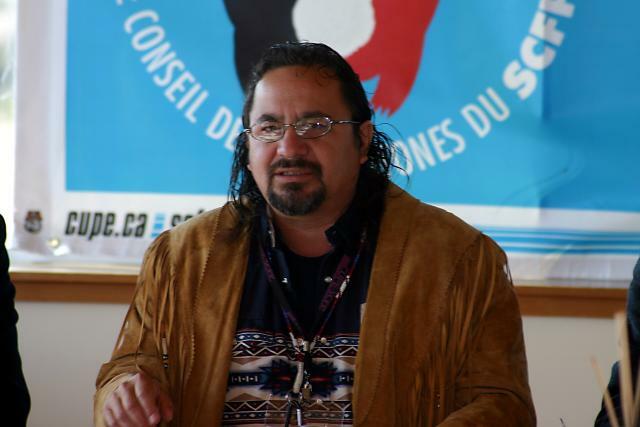 CUPE argues that organized labour has a responsibility to reduce the social barriers in the workplace to better accommodate the growing Aboriginal working classes. Reducing the social barriers also means being inclusive of Aboriginal cultural values and ideas and providing a place for Aboriginal leadership. CUPE also believes that unions need to prepare for an influx of Aboriginal workers in the workplace and examine union structures for barriers to participation. Through a signed Partnership Agreement with the Saskatchewan Association of Health Organizations (SAHO) and First Nations and Métis Relations (provincial government) in 2000, CUPE agreed to work toward building a representative workforce. Many other unions in the province then signed Partnership Agreements. The overall strategy of the representative workforce approach was to hire Aboriginal Peoples in all classifications and at all levels in proportion to their representation in the working age population within the community or the provincial population. The representative workforce strategy strives to build a workforce where Aboriginal people compete for jobs based on their skills and qualifications, and to increase their participation in all areas of the workplace. Creating an equal playing field and removing barriers to Aboriginal employment were crucial to recruiting and retaining qualified Aboriginal talent. Efforts at better coordinating policies for First Peoples were neither unique to the health sector nor to Canada. Numerous Saskatchewan health regions undertook efforts since the late 1990’s to improve coordination in policy-making through signed partnerships between only the employer and the government and then further with non-governmental organizations. These partnerships were realizing minimum effects until the unions became involved. When CUPE was first approached, CUPE’s consideration included many important factors. A few of the major factors included ensuring its membership were onboard in designing a program focussed solely on Aboriginal participation in the workforce and seeking a way to attain a respectful workforce. Before creating an Aboriginal employment strategy for the union, it was important to understand the diverse backgrounds of First Peoples. The more informed about the communities CUPE decisions may impact, the better decisions CUPE could make. Through discussions with CUPE First Peoples, CUPE realized a First Peoples policy must consider a holistic approach to achieving success. A holistic approach requires involving First Peoples in the process of developing an Aboriginal policy or strategy for the union. In September of 2000, CUPE held Tripartite meetings with Saskatchewan Association of Hospital Organizations (SAHO) and the First Nations and Métis Relations (provincial government) which resulted in the parties mutually agreeing in principle that initiatives were needed to modify the collective agreement, to design language to encourage potential Aboriginal workers to participate in and be integrated into the health sector labour force in proportion to their labour force numbers. Specific to the health sector, the parties had undertaken a holistic five-pronged approach which included a needs assessment, developing collective agreement language, preparing the workplace, creating an outside supportive education system and managing new hires and current members with succession planning. This five-pronged approach wasn’t necessarily accomplished as separate goals as many components were being worked on as a whole. The first phase was a needs assessment for the health sector, a snapshot of the workplace, upcoming needs such as vacancies, retirements and hard to fill positions. Through the work of SAHO and CUPE this was accomplished over many meetings. The second component was developing language and ratifying the language into the collective agreement. All parties to the partnership, including the provincial government, met and developed language that needed to be ratified by the membership of CUPE and SAHO. The third prong, preparing the workplace, focussed on awareness training needed to ensure a representative workforce was accepted in the workplace. CUPE and SAHO developed an Aboriginal awareness course to address recruitment and retention problems of Aboriginal workers in health care. The course tackled the miscommunication, misunderstandings, and frustrations that occur between Aboriginal and non-Aboriginal workers in the workplace, because of the aboriginal myths prevalent in Saskatchewan society. These obstacles can be overcome by making all parties realizing the myths are not real and ensuring participants become culturally sensitive. CUPE/SAHO’s Aboriginal Cultural Awareness course is designed to provide non-Aboriginal participants with a greater understanding of the issues and challenges facing Aboriginal people in Canada. The Aboriginal Cultural Awareness course was mandatory for the CUPE membership. The mandatory attendance was voted on by the CUPE membership who agreed that all members must take the course. The program covers the groups that make up Canada’s Aboriginal population, examines history from a First Peoples perspective and explores the ways in which historical injustices have impacted Aboriginal culture. The fourth piece was creating a supportive external educational environment for the positions which were defined by the needs assessment. Once a needs assessment is completed, and known vacancies and qualifications are identified, the First Peoples educational institutions must be informed of the needed qualifications and design their training around these needs. With regards to the fourth element of a CUPE driven representative workforce strategy a network needed to be involved where all partners could meet to discuss upcoming needs and qualifications and ensuring the educational institutions were ready to train their members. The provincial government introduced CUPE to the Provincial Aboriginal Representative Workforce Council (PARWC) in February 2000 with a mandate to develop strategies for delivering training linked to partnership employer job opportunities. At this table, many of the organizations involved with government on partnerships also came together to discuss best ideas. On February 5, 2003, CUPE was honoured at the Provincial Aboriginal Representative Workforce Council’s (PAWC) Recognition Banquet for CUPE’s commitment to the partnership. The fifth element, managing the workforce with succession planning, is built around the notion of “career laddering.” CUPE and SAHO devised a career pathing process throughout the health sector in Saskatchewan in support of building a representative workforce in the sector and continue awareness training for newly hired and existing CUPE members. From 1992 to 2010 the Saskatchewan government’s message was to meet provincial labour market needs through workplace preparation. By building linkages to the First Nations and Métis workforce, the program aimed to ensure representation at all occupational levels. This participation at the time was considered by the government as an integral component to Saskatchewan’s future success with indigenous statistics. The problems unions have seen with the strategy before we signed on was that it focussed only on one designated group, it did not include unions and seemed to be providing lip service. By assessing the program from the sidelines since health care providers began to sign the partnership, the program seemed to be going nowhere fast. At this time CUPE realized the program had potential. The government was instrumental to the partnership between SAHO and CUPE. This is reflected when you review the numbers of partnerships the government were part of. As of March 31, 2009, there were 98 total partnerships, 4,465 Aboriginal hires, 36,676 employees received awareness training and 1,996 received work-based skills training. PARWC linked the Aboriginal community to the demand side by providing information of First Nation and Metis communities on skill requirements for employer demand. Aboriginal communities are then responsible to prepare themselves through formal learning and education. They are responsible to encourage youth to achieve the maximum knowledge and skills to participate in the identified employment and economic opportunities. All training institutes are responsible for the results of education and training provided to youth by ensuring they are receiving the education and achieving the standards that will make them competitive. On March 24, 2010, the Saskatchewan Party government notified CUPE and other unions that they were closing the Aboriginal Employment Development Unit (AEDP) and would no longer support Aboriginal employment directly. The AEDP agreements were cut in the 2010/11 budget. At that time CUPE lost its Saskatchewan Aboriginal coordinator and trainer in which the government had partially funded. Without government funding, CUPE and SAHO continued with a committee structure that provided for the ongoing management of components of the partnership agreement in health care. Both sides were committed to achieving a representative workforce. CUPE and SAHO agreed to utilize EI rebate money for funding the Provincial Employment Strategy Committee (PESC). The rebate gets deposited into the PESC account in the amount of approximately $1,186,499.08 per year. In 2015-2016 alone, 1,220 applications have gone through the program for education funding and have been approved for funding by the Provincial Employment Strategy Committee (PESC). The approvals have totaled over $1.4 million this year in education funding to help CUPE employees and CUPE health regions. PESC has currently recruited and continues to train new Aboriginal Awareness Training (AAT) Facilitators. Updated material is now being used in the AAT program, this program which was initiated for CUPE members, now provides education to all employees within the CUPE health regions. PESC strives to continue to provide funding opportunities to those CUPE employees and CUPE health regions that require assistance to expand or upgrade their education. The Committee has completed the process of updating the Aboriginal Awareness Training. Currently, the committee continues to provide a four (4) hour Aboriginal educational to CUPE members and managers. The education assists in the preparation of the work place, in dispelling myths and dealing with misconceptions regarding Aboriginal people. SAHO continues to employ a Representative Workforce Coordinator in each region. On January 10, 2015 Premier Wall pointed to a number of initiatives his government has launched in connection with education and employment and Aboriginal Peoples. “We have a labour shortage and the very first place we should look for new workers is not the temporary foreign worker program, it’s not even the immigrant nominee program, it’s Saskatchewan people,” Wall said. “If you have under-employment amongst a large population of Saskatchewan people, as we still do with First Nations or Aboriginals, then we need to make that a priority.”  Let’s HOLD HIM TO THIS! a) Preamble: The parties will address proactive processes that support a representational workforce which shall include but not be limited to identifying employment opportunities, education and training and preparing workplaces. b) Workforce Representation: The parties agree to the principle of a representative workforce for Aboriginal workers. The parties agree to charge the Employment Strategy Committee with the responsibility to develop, implement, monitor and evaluate pro-active initiatives designed to ensure Aboriginal people are present in all occupations in their proportion to the provincial working population. Therefore, when hiring new employees, the Aboriginal representative principle shall be applied, providing there are qualified Aboriginal applicants for the vacancy. c) Workplace Preparation – The parties agree to implement educational opportunities for all employees to deal with misconceptions and dispel myths about Aboriginal people. This will include enhanced orientation sessions for new employees to ensure a better understanding of respectful work practices to achieve a harassment free environment. d) In-Service Training – The parties agree to facilitate educational opportunities which may include literacy training and career path counseling/planning. e) Elders – At the request of the employee, an Elder will be present when dealing with issues affecting Aboriginal employees. f) Accommodation of Spiritual or Cultural Observances – The parties agree to make every reasonable effort to accommodate an Employee to attend or participate in spiritual or cultural observances required by faith or culture. 1. Cheryl Stadnichuk. (April 2011). Creating a Representative Workforce. 4. Cheryl Stadnichuk. (April 2011). Creating a Representative Workforce.